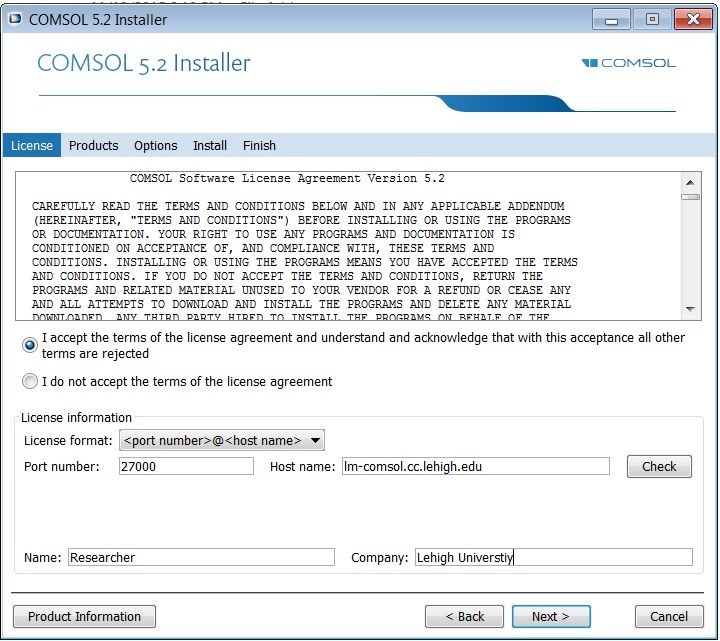 Lehigh has a network license for COMSOL, and a Windows installer for the software is available at https://software.lehigh.edu (LUIS). Download the .iso file. This file is an archive of the software vendor's DVD, containing the installer program, and all of the software files. It's available on the Lehigh University Install Software pages (http://software.lehigh.edu). You'll need to log in with your Lehigh username and password. Mount the .iso file, open it, and run 'setup.exe'. Once the COMSOL installer has started, you'll select a language, click 'New COMSOL Installation', click the radio button to accept the license agreement, and make sure to enter the information about the license server, by selecting 'portnumber@hostname' from the 'Licensing Format' pull-down menu in the 'Licensing Information' section. Continue by clicking 'Next' to accept the default configuration selections. The installer may need to download updates, which require additional 'Installations'. Simply continue until the installer shows that you've completed it successfully. A COMSOL program icon will be available on your desktop.